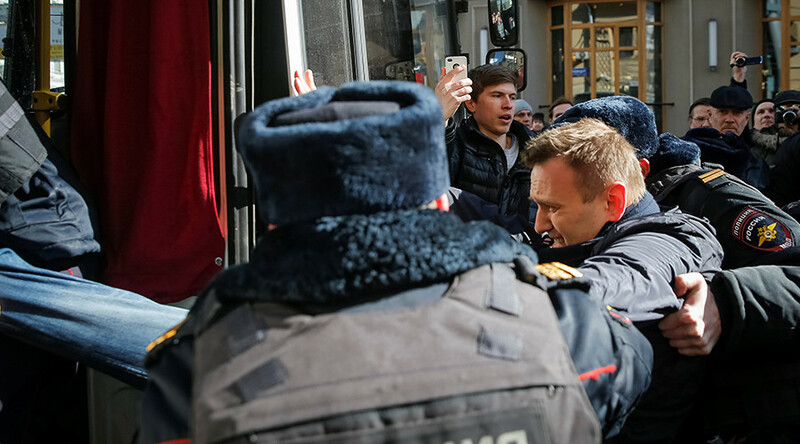 An estimated 600 people have been detained in central Moscow during an unsanctioned rally, with opposition figure Aleksey Navalny among them. Similar rallies, some unsanctioned and others permitted by local authorities, took place across Russia. 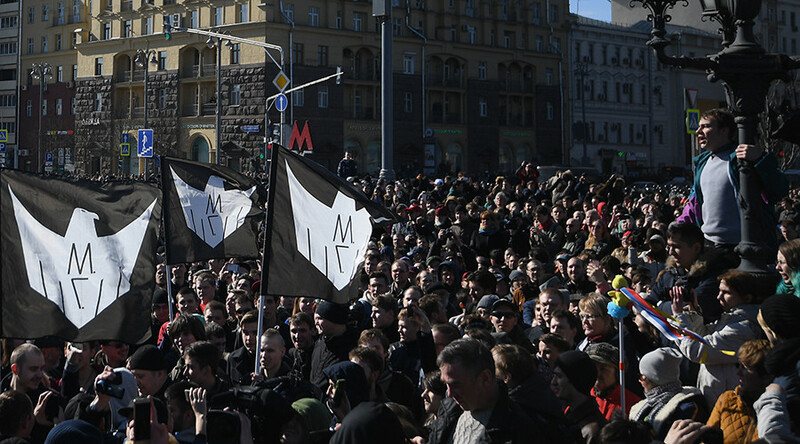 Some 8,000 demonstrators took part in the protest, law enforcement officials were cited as saying by Russian media. As the rally continued, police used loudspeakers to call on the protesters to disperse. Navalny was detained shortly after showing up for the event in the center of the Russian capital. He was charged with violating an administrative code regulating public gatherings and is facing a fine, community service, or administrative detention, TASS reported, citing police. Protesters came despite failing to receive permission from the mayor’s office to hold a rally at the site of their choosing. The authorities suggested two alternative locations for the event, but the organizers rejected them. 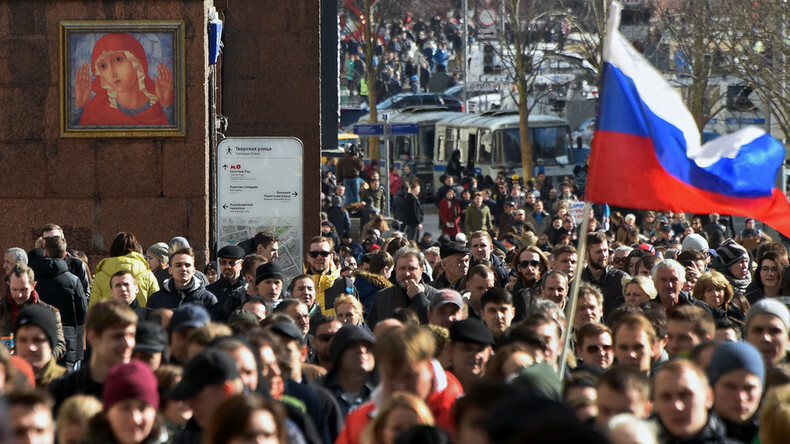 Moscow police warned Saturday that participating in the unsanctioned rally could pose a risk to personal safety and advised people against doing so. 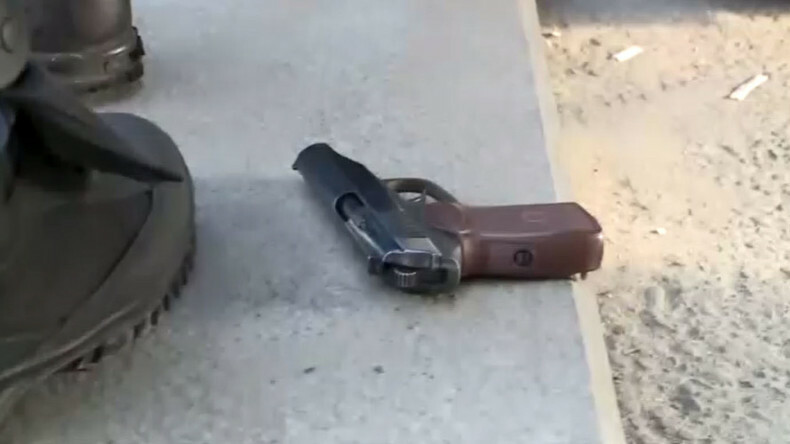 A man with a gun was among those detained at the rally. The moment was captured on film by RT’s Ruptly video news agency. All those detained have been delivered to local police stations for further administrative procedures. According to police, one officer suffered a head injury during the protests. He was hit in the head by one of the rally’s participants, authorities said, adding that the officer was hospitalized with a brain injury. A video has emerged online showing a riot police officer lying on the ground, seemingly unconscious. The police also detained a reporter from British newspaper the Guardian, Alec Luhn, who wrote about it on Twitter. A law enforcement official told RIA news agency that Luhn was released without any charges immediately after it was established that he was indeed a journalist. I was released 5.5 hours after being arrested at @Navalny protest & charged w/"holding an unsanctioned rally"—Thanks for messages & support! Law enforcement say that somebody sprayed “irritant gas” in the capital’s Pushkin Square, but rejected reports that it was part of a police action. 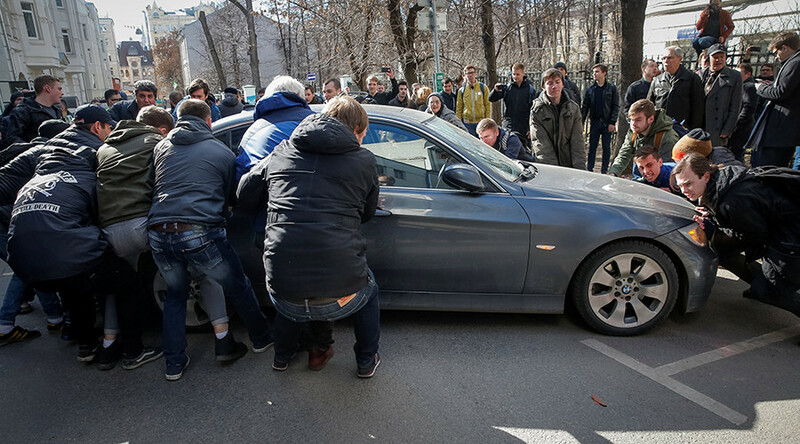 A photo of a young woman being detained by police has been making waves on social media with Navalny supporters using it as an example of excessive force allegedly used by law enforcement as they disperse protesters. Police released most of those detained shortly afterward. The usual procedure for such cases of detention (which falls short of an arrest, which has to be sanctioned by a court) is to identify the individuals for potential administrative action and then release them. Reports on social media said that multiple teenagers were detained at the protest. “I can’t say there were many of them,” Chernikov told RIA. “They were acting aggressively… and that became a source of concern,” he said, adding that he did not yet have the actual figure for the number of underage rally participants who were detained. Navalny called on his supporters to protest on Sunday, weeks after releasing a report on the alleged corruption of Russian Prime Minister Dmitry Medvedev. He accused the head of the Russian government of personal enrichment through embezzlement.